If you have any doubt about it just look at the adoption rate … look at the study results published … or just try it yourself. Again, if you have any doubt, just look at the growth of offshoring … look at the success of the success of the India based IT companies … try to find a reasonably large company which has no offshore presence. People or Process … which is more important? If you are following agile methods then … obviously … people are more important. In fact it is clearly stated in the Agile manifesto. Of course, the manifesto does not say that process is not important but it emphasizes that people are more important than process and tool. If you are into offshoring then the clear winner is process. Almost all large offshoring outfit have focused on process and have adopted SEI-CMMi model. On the same vein, CMMi does not say the people are not important, but the focus is clearly on processes and practices. But, is this not contradictory? One possible explanation is that both people and process are important. Successful agile implementation does not ignore process. Similarly, successful offshoring does not ignore people. 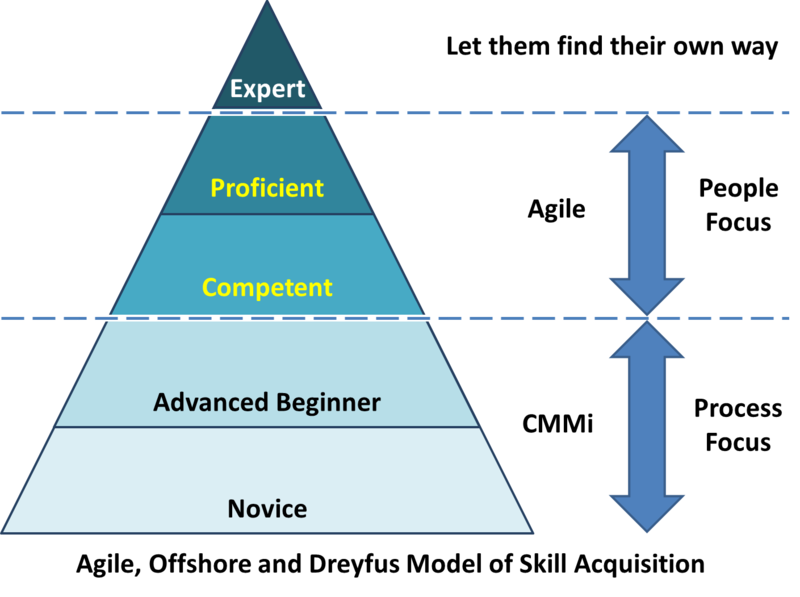 However, a better explanation can be found in the Dreyfus Model of Skill Acquisition. When the offshoring started, the workforce comprised of Novices and Advanced Beginner with a handful of experts guiding them. The growth of offshoring was too fast to move the Advanced Beginners to become Competent in the required number. Therefore, it was logical for the organizations to focus on gaining process expertise and the most logical choice was the SEI – Capability Maturity Model (CMMi). The focus was on “Conformance to Requirement”. It was necessary to have more people to do the same work but that could be absorbed through the huge gap of salary. Every project needed to find at least on expert. That expert could guide the team and interact with the onsite people. Projects which could not find such experts failed badly. The growth of the offshoring industry have validated this approach. Agile methods became popular where enough number of Competent and Proficient software developers where available. Once a developer becomes Competent he is ready and willing to take ownership of his work. It is no surprise that agile methods worked and worked very well. The story of offshoring is not over yet! Offshoring growth came down from the ridiculous 30-50% per year to more down to earth 10-15%. That allowed more time to have sufficient numbers of Competent and Proficient developers. There are around 2 million ITES professional in India and even if only a small percentage can be classified as Competent and Proficient developers, you still land up with a huge number! The expert observes the world but trusts his inner vision. He concerns himself with the depth and not the surface, with the fruit and not the flower. The expert shapes events as they come. He steps out of the way and lets the design speak for itself. His workings remain a mystery, he just shows the results. This might sound familiar to you because this is an condensed and modified version of The Tao of the Software Architect.